Photographer: Melissa Goodwin, Prop Stylist: Vaughan Glidden, Food Stylist, Hannah Kirshner. Somewhere between glamping and mountaineering, there’s a style of camping that most appeals to me. You head up with a couple of friends on a short hike to a basecamp, with everything you need on your back (not in a car). It’s not a far walk, but the setting is pristine. You set up camp for a few days: From there you do day hikes, swim in a lake, and make good food together. While you’re not going to haul a cooler, you could bring a couple of beers to chill in a stream. 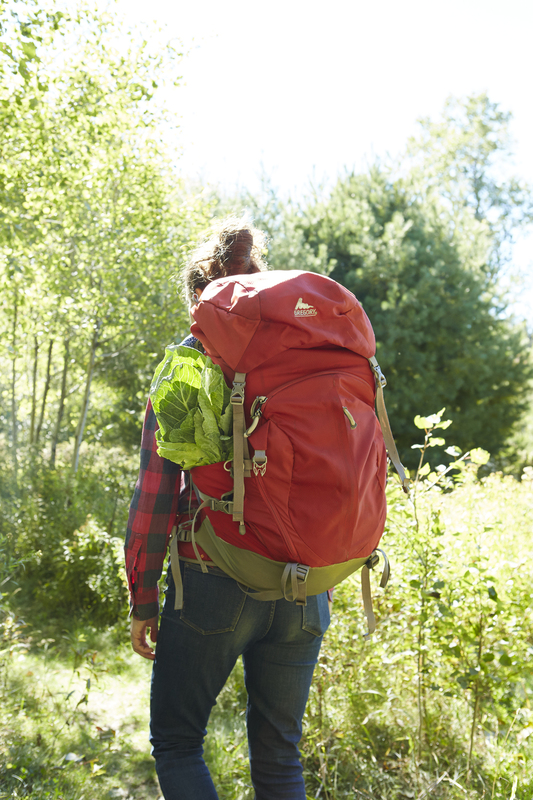 The food needs to be light, but not as light as for a multi-day trek, and you can bring fresh groceries that might not last a week, but will keep for a day or two. Collards are the sturdiest green I know of, and—I tested this—will hold up after a day strapped to your backpack in cool weather. Serve them for breakfast with cheese grits, eggs and chorizo. There’s no reason not to make good coffee when you’re camping. And it will taste better than ever on chilly morning in the great outdoors. Bring a nel drip or a good ol’ plastic Melita, and your favorite beans (ground just before you leave). You’ll want to make coffee first, of course, and then begin cooking breakfast. Start by pouring hot water into instant or quick-cooking grits. 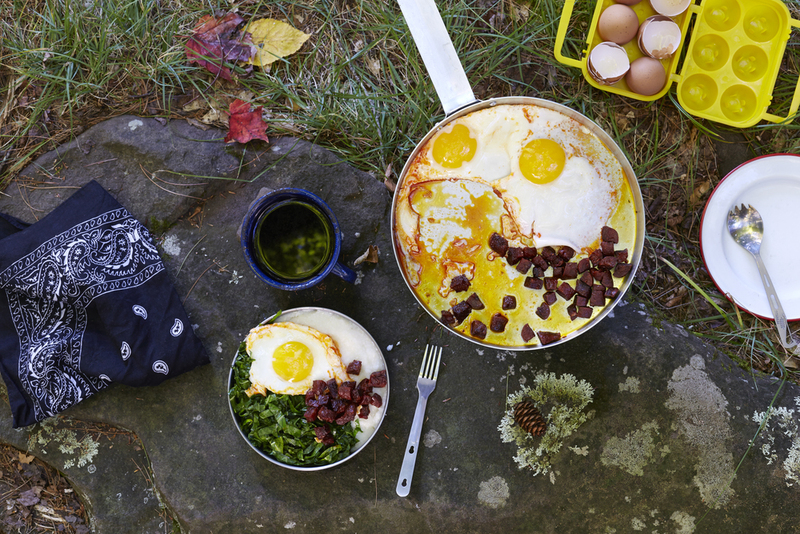 Cover them and set them aside—if it’s really cold out, wrap the pan in a bandana or towel to keep it warm. Cut the collards into thin strips and toss them with oil and garlic; in a hot pan they’ll cook in a flash, without using up all your camp fuel. They’re done when bright green and tender, just a minute or two. After you turn the collards out of the pan, you can put in a handful of chopped chorizo. When it’s crisp and its red oil has greased the pan, push it to one side and crack in a few eggs. (Yes, you can take eggs camping! Truly farm fresh eggs are ideal, because if they’ve never been washed they have a natural protective coating). Stir some parmesan cheese into the grits (the kind you shake from a can is fine, we’re camping), and a pat of butter or glug of olive oil. Serve all this together in a bowl, with more coffee alongside. Is this not the best backpacking breakfast you’ve had? Back home, you can make it again and invite friends for brunch, inspiring envy with tales of your gourmands' camping trip. So there's a newspaper editor, a sake sommelier, an artist, a play producer, and a concert pianist—this isn't the set up for a joke but the guest list for a dinner party in my Brooklyn apartment. The sommelier (for lack of a better translation) who is staying with us for a week has brought an entire suitcase of sake with him from Japan. This isn't hyperbole—there are at least seven bottles, four of them magnums. He got so excited about the idea of a dinner party, that he also brought his framed calligraphed certificate (less than 300 people have his level of expertise), and his uniform: a vest with lapel pins, a red tie, and one of those Japanese aprons made of fringed heavy canvas with his bar’s insignia (the editor and I try to bribe him for the apron, but it only makes him blush). He even brought his own glassware—five different kinds. Meanwhile, I've set out mismatched napkins, and plates that I consider a set because they are all white (but not really the same). I made a bouquet with branches from my back yard and a few flowers from the abandoned house across the street. How will I cook a meal to match a suitcasefull of sake? To match our traveller’s ernesty and precsion? I approach dinner parties with the same mix of excitement and apprehension you might feel before a first date—what if I get all dressed up/plan an elaborate menu, and then they cancel at the last minute? It’s happened plenty of times. And you don’t want to look like you’re trying too hard. But this time, everyone is here, and I’ve gotten a little carried away with the menu in spite of my efforts to be cool. It’s a muggy summer night. I’ve cooked as much as I can on a tiny charcoal grill in my back yard so I don’t heat up the apartment. It starts to drizzle as I carry the food back upstairs. 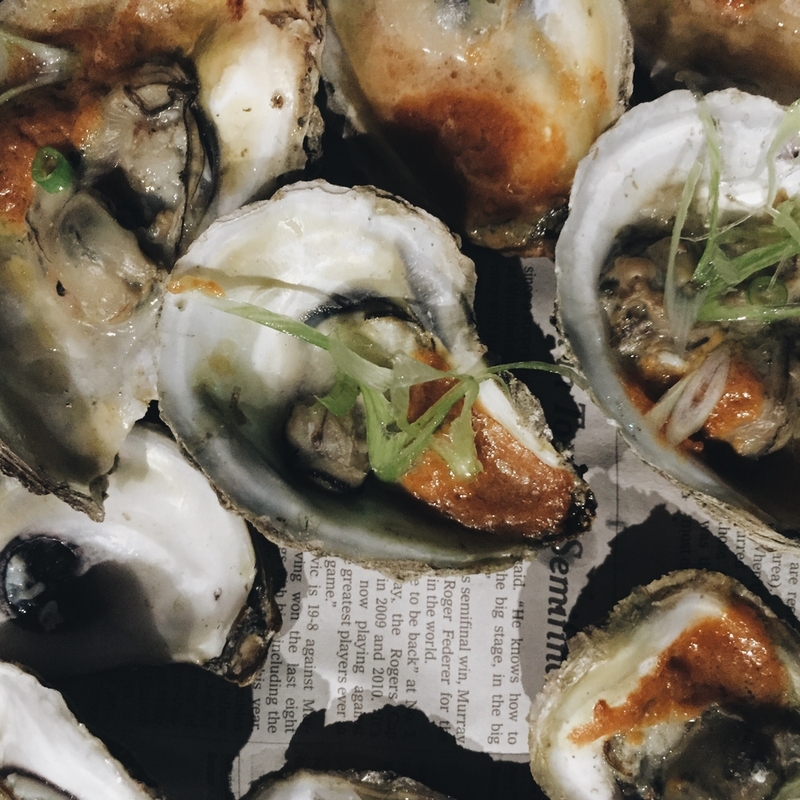 I set down a platter of grilled oysters, bubbling with miso and scattered with slivers of scallion. Our sommelier pours a savory aged sake into laquerware cups, and we oohh and ahh at its funky and refreshing counterpoint to briny oysters and earthy miso. I return to the kitchen but I can hear lively conversation and laughter. I’m dressing mizuna greens and citrus slices with a sesame oil and ponzu. I’m simmering clams in dashi for clam miso soup, and keeping the rice warm in a heavy pot on the back of the stove. I arrange packets of steamy shio-koji marinated flounder wrapped with banana leaves—with their faintly floral and charred scent. I paint some squid ink on a plate while the grilled squid reheats under the broiler. I sprinkle a chiffonade of shiso over watermelon and feta. These are mostly Japanese flavors—subtle and fresh so they don’t compete with delicate sake—cooked in my own way. The sommelier joins me in the kitchen and we lean over the plates, gesturing; we speak only a few words of each others’ languages, but we both get giddy about flavors. Pairing food and drinks is a game, and we’re having fun! He sprinkles more salt on the watermelon, showing me that it makes a bitter sake taste less bitter, then returns to the dinning room for a parlour trick where the flavor of one sake is transformed by drinking it from different shapes of glasses. I keep bringing out food and he keeps bringing out sake. There’s not a grain of rice left on the table at the end of the night. It wasn’t just the amazing sake or the fresh seafood and vegetables but the wide-ranging and lively conversation that made this dinner so delicious, and the chance to share it with a group whose enthusiasm could match that of a man who brings an entire bar in his suitcase. This recipe has evolved since that dinner party. I was told that butter doesn't go with sake, so for the original version I simply thinned the miso with sake. But I made it several more times over the course of the summer and concluded that butter is better. The balance of flavors in this recipe is just right—try drinking a Muscadet or lager if sake doesn't suit. In a small bowl, make a compound butter by mixing the miso and butter together into a smooth paste; set aside. (This compound miso-butter is delicious on toast, or melted and brushed on vegetables for the grill, or...just use your imagination)! Mice one of the scallions: you should have about a tablespoon of minced scallion. In another small bowl, make the mignonette by mixing the minced scallion with the rice vinegar and sake; set aside. Slice the remaining scallion very thinly on an extreme diagonal. Put the sliced scallion in ice water until ready to use to keep it crisp and take away some of its sting. Get the grill hot. Shuck the oysters, leaving the meat in the deeper half of the shell. Yes, they would open on their own on the grill, but by the time they open and you get the miso-butter in they'll be over cooked. It's worth it to shuck them first. Put a tiny dollop of miso butter into each oyster, about 1/2 teaspoon. Place them on a very hot grill, you don't want flames licking them, but you want it pretty darn hot. Leave them there just until their liquid bubbles and the butter browns ever so slightly around the edges of the shell, then remove them quickly. Scatter the thinly sliced scallions over the oysters, and serve immediately with mignonette on the side. I remember a phone call from my friend, nearly in tears, because the chocolate cake she baked from a recipe I gave her broke coming out of the pan. She was cooking for a date and he would arrive soon. We devised a plan the serve cake chunks in a bowl with ice cream and berries: she could pretend that was her intention all along. She called the next day to tell me that the dessert—and the date—was a success. A macaron isn’t technically a macaron unless it has a foot (that little ruffled bleed around the bottom), and if the top cracks instead of forming a smooth dome that’s a dead giveaway that you did it wrong. When a batch of my green tea macarons failed (they tasted wonderful but were not pretty enough) I stored them in the freezer so I could figure out another way to use them. Months later, tasked with making dessert for a party, I sandwiched strawberry ice cream between the cookies and dusted them with matcha. The delicate pink and green ice cream sandwiches produced ooohhs and ahhhs! Another failure turned into a success. I mess up all the time. I skim recipes and skip steps, I let things overcook while I scroll through Instagram, I forget to add the salt, I drop a pot on the floor and spill a sauce that’s been stewing for hours. Being a good cook doesn’t mean getting it right every time. It means rolling with the punches, transforming mistakes into new recipes. Many a restaurant special is the result of emergency improvisation. With confidence and good seasoning, you can pull of almost anything. Don’t apologize: if it tastes and looks good, no one cares how it was supposed to turn out. I got really excited to make the miso sugar I saw in the pages of Bon Apetit. Without really consulting the recipe, I prepared a batch to serve as a salty-sweet ice cream sundae topping for a dinner party. I had the whole thing in my head: cornflakes at the bottom for crunch like they do in Japan, vanilla ice cream, in-season strawberries, and a sprinkle of salty-sweet miso sugar on top. With five guests sitting at my table, I opened my cool oven where the miso sugar had been drying for 24 hours and discovered that it was just burnt goop. Quickly, I mixed up a batch of miso butterscotch instead, so I could put those same flavors into my sundae. Ten minutes later we were eating sundaes, and they were perfect (at least, I thought so). This is now one of my favorite desserts ever! Here’s the recipe. I got the idea for a miso-strawberry-cornflake sundae from a miso caramel ice cream at the Good Fork, a giant parfait I had in Japan, and this recipe from David Lebovitz for roasted strawberry and miso ice cream. It might sound like an odd combination of flavors, but try it! As strawberries go out of season, you could try using raspberries or peaches, which might be even better. Layer the cornflakes, then a little fruit, then ice cream, more fruit, and finally the miso butterscotch sauce. Place the butter and sugar in a small saucepan, and cook over medium heat. Stir until the butter melts completely, and the sugar is fully dissolved. When the mixture is thick and glossy, about four minutes, stir in the cream. Remove from heat, and whisk in the miso. Serve warm—the mixture will thicken as it cools. Keeps for several weeks, refrigerated; reheat gently to serve again. When it comes to food, the conversation is often about health or pleasure, but not both. There are unpalatable pond-colored juices and cardboard-textured bars for health, oversized candy-topped sundaes and mounds of gravy-drenched poutine for pleasure. But when you cook with beautiful, fresh ingredients both enjoyment and good nutrition are inevitable. 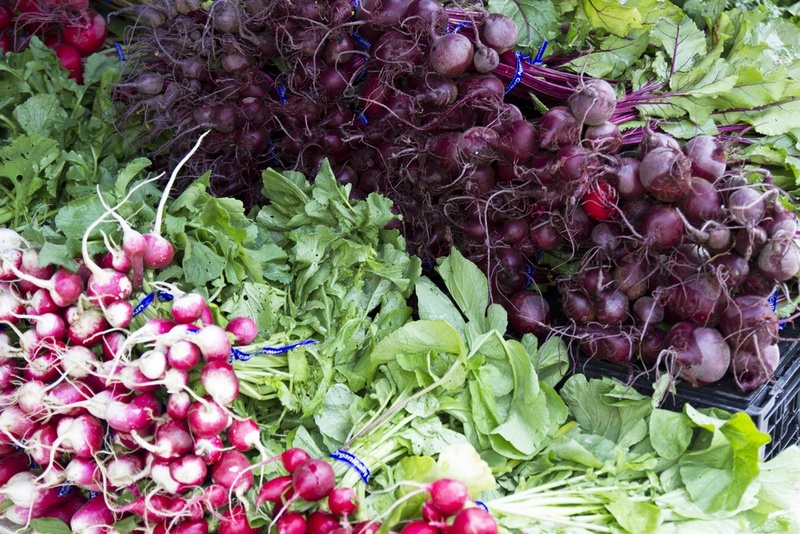 With great produce, all you have to do is add a little seasoning and stay out of its way (i.e. no heavy sauces or cooking-to-death). That's where Marissa Lippert, registered dietician and owner of Nourish Kitchen + Table, and I see eye to eye. We met at the farmers market on a June morning, with no more plan than to shop and cook together, and share our ideas about good eating. We picked out the fruits and vegetables that excited us––butter lettuce, breakfast radishes, chive blossoms, ripe strawberries––and went back to Nourish to make a summer brunch. Here are some photos, and suggestions for creating your own meal rich in nutrition and deliciousness. Marissa and I were both taken with these gorgeous heads of lettuce! Holding them at the market, we were inspired to make a salad with the whole head. We rinsed the head of lettuce, gently patted the leaves dry, then cut out the core and carefully placed the whole head in a bowl. 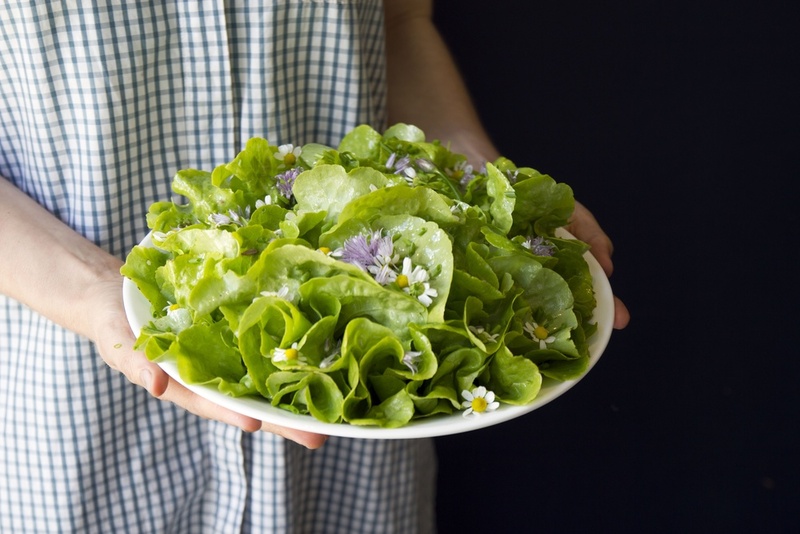 We dressed the leaves with a sprinkling of vinaigrette, rubbed in by hand, then scattered chive blossoms, chamomile flowers and chopped chives over the whole thing. Wild plants often contain higher concentrations of micronutrients than cultivated greens like spinach or kale, so we were excited to try cooking lambs quarters. You likely passed a patch of these edible weeds in an empty lot or yanked some from your garden just this morning. While roadside weeds aren't necessarily safe to eat (lead contamination), farmers markets have started selling them. Marrissa sauteed some up with lots of green garlic and spring onions, and served them with a poached egg and toast. One of the easiest and most refreshing drinks you can make is white or rosé wine + fruit + fresh herbs + seltzer. You know strawberries are good when you can smell them as you approach the farm stand; we macerated a pint with a heaping spoonful of sugar and a few shiso leaves, and let that sit until the strawberry juice made it's own syrup. We poured wine over the macerated berries then topped each glass with seltzer and more shiso. 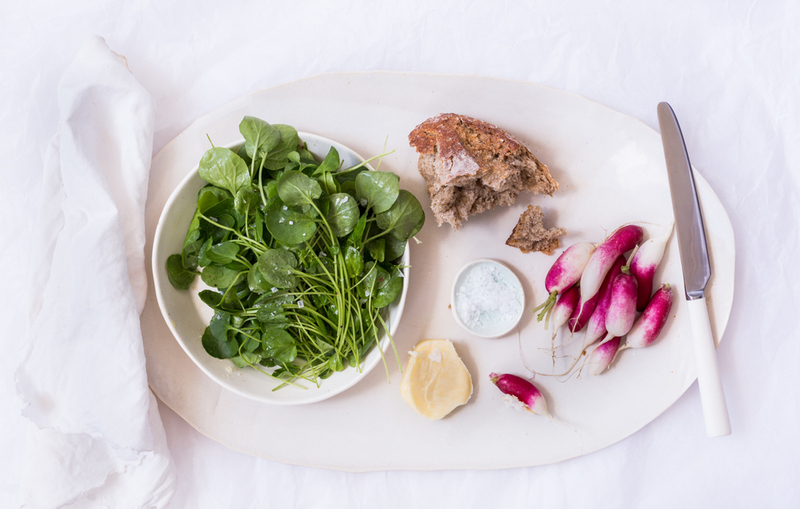 We couldn’t resist grabbing a bunch of radishes to snack on with good butter. I don't have much to say about this combination other than that it's perfect! 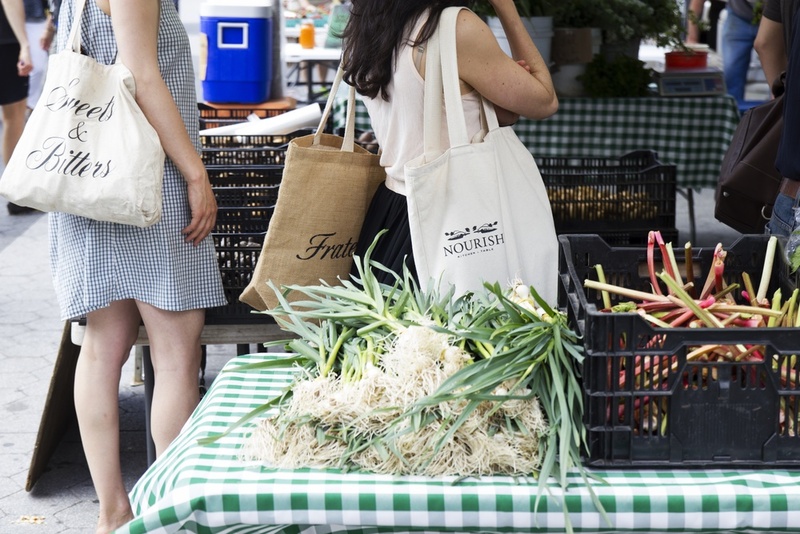 We would love to hear about your nutritious and delicious market meals in the comments! When you see that unmistakable blush, grab one of the first bright colors to appear at the farmers' markets: a bunch of mild, perfectly crunchy radishes. There's no better way to enjoy those spring gems than with good butter (I like the cultured kind from Vermont Creamery) and a sprinkle of flakey sea salt. To make a meal of this, tear off a hunk of crusty bread, and dress a handful of cress with a squeeze of lemon and a drizzle of olive oil. Or serve a tray of radishes and butter as an elegant cocktail hors d'oeuvre. Either way, this peppery and creamy pairing is one of the highest pleasures of the season. For more spring salad ideas, with photography by Burcu Avsar, check back in a few days.